Objective To assess changes in survival for infants born before 26 completed weeks of gestation. Design Prospective cohort study in a geographically defined population. Setting Former Trent health region of the United Kingdom. Subjects All infants born at 22+0 to 25+6 weeks’ gestation to mothers living in the region. Terminations were excluded but all other births of babies alive at the onset of labour or the delivery process were included. Main outcome measures Outcome for all infants was categorised as stillbirth, death without admission to neonatal intensivecare, death before discharge from neonatal intensivecare, and survival to discharge home in two time periods: 1994-9 and 2000-5 inclusive. Results The proportion of infants dying in delivery rooms was similar in the two periods, but a significant improvement was seen in the number of infants surviving to discharge (P<0.001). Of 497 infants admitted to neonatal intensive care in 2000-5, 236 (47%) survived to discharge compared with 174/490 (36%) in 1994. These changes were attributable to substantial improvements in the survival of infants born at 24 and 25 weeks. During the 12 years of the study none of the 150 infants born at 22 weeks’ gestation survived. Of the infants born at 23 weeks who were admitted to intensive care, there was no significant improvement in survival to discharge in 2000-5 (12/65 (18%) in 2000-5 v 15/81 (19%) in 1994-9). Conclusions Survival of infants born at 24 and 25 weeks of gestation has significantly increased. Although over half the cohort of infants born at 23 weeks wasadmitted to neonatalintensive care, there was no improvement in survival at this gestation. Care for infants born at 22 weeks remained unsuccessful. In the autumn of 2007 a House of Commons select committee reviewed the legislation on abortion in the United Kingdom.1 A House of Commons debate on the subject was scheduled for early 2008. Current legislation limits abortion to before 24 weeks’ gestation unless there are specific medical issues. It has been suggested that because of improvements in medical care for such babies this limit should be lowered. During discussions in the select committee it was recognised that published peer reviewed UK evidence is lacking to answer the question of whether the survival of infants born at 23 or 24 weeks has improved in recent years. We compared the survival of infants in a geographically defined population born before 26 weeks’ gestation in 1994-9 and 2000-5. We included in the study infants alive at the onset of labour, born between 1 January 1994 and 31 December 2005 and before 26 completed weeks’ gestation, and born to a mother whose normal home address was within the former Trent health region. The Trent region is a geographically defined population of about 4.6 million, with about 55 000 births a year. Sixteen hospitals within the region provide maternity and neonatal services. The outcome measures were stillbirth or miscarriage, death without admission to neonatal intensivecare, death before discharge from neonatal intensivecare and survival to discharge home. We compared two periods of six years: 1994-9 and 2000-5 inclusive. We assessed the significance of differences in outcomes between the two reported time periods with χ2 tests and determined birth rates with the overall regional births data from the Office for National Statistics (ONS). SAS v8.2 software was used for all analyses. There was a marked improvement between the two time periods in the survival to discharge of the infants born at 24 and 25 weeks who were admitted to intensive care (figure)⇓. This amounted to an improvement from 24% to 41% (P<0.001) in the 24 week group and from 52% to 63% (P=0.016) in the 25 week group. These improvements were not seen in those born at 22 and 23 weeks. In both time periods none of the infants born at 22 weeks and admitted to neonatal intensivecare survived to discharge. The rate of survival to discharge after admission also changed little for infants born at 23 weeks’ gestation, being 18.52% in 1994-9 and 18.46% in 2000-5. Our findings cannot be explained by a change in obstetric practice or neonatal resuscitation practice as similar numbers died in the delivery room in both time periods (1994-9 and 2000-5). These deaths are a mixture of infants who were born dead, born too sick to be successfully resuscitated, or treated conservatively with agreement between parents and staff. We have no robust mechanism for differentiating those deaths that occurred because aggressive resuscitation failed from those where such resuscitation was considered inappropriate. Despite a slight fall (from 55% to 50%) in the proportion of infants who were admitted to a neonatal unit at 23 weeks’ gestation, our results indicate no change in the attitude to those admitted. In 1994-9, 78/81 infants (96%) received intensive care compared with 62/65 infants in 2000-5 (95%) (P=0.78). The remaining infants received palliative care alone. When clinicians consider the appropriateness of intensive care for extremely premature infants they often use the survival figures and developmental outcomes of the EPICure study.5 This study was a prospective cohort study of all infants born at 20-25 completed weeks’ gestation in the UK and Ireland during a 10 month period beginning in March 1995. It provided valuable data on chances of survival for extremely premature infants. With significant improvements in technology and altered attitudes of those caring for these infants these data may no longer be applicable to current infants and the EPICure study has recently been repeated. As a geographical region Trent is reasonably representative of the UK as a whole.8 It is therefore unlikely that our data are substantially at variance with outcomes of neonatal intensive care across the UK. There are few other population based studies of this type from around the world but those from northern Europe have reported similar rates of survival.9 10 In Scandinavia rates are generally a little higher, with the best of these reporting 40% survival at 23 weeks for babies admitted to intensive care.11 12 13 Data from studies with different methods (such as based only on live births) are difficult to compare because of inconsistencies in the way babies at the margin of viability are classified.14 We consider that data from single centre studies are impossible to interpret as improved outcomes are more likely to reflect inclusion and selection bias than differences in approaches to management or availability of resources.15 The use of resources associated with the care provided to babies in our study, however, markedly increased between the two time periods. This trend has major implications for the neonatal service as a whole. The approach to estimation of expected date of delivery and gestation changed over the period of the study, with most current pregnancies undergoing a dating scan compared with perhaps 50% at the start of the study period. Such a change clearly has the potential to introduce systematic bias. However, over the whole 12 year period just eight trained and experienced nurses who used the same algorithm throughout collected data for this work. We think that our results are unlikely to simply represent a different approach to classification of gestation in the two time periods. There was a relatively small number of babies born at 22 and 23 weeks’ gestation. While this might be why we could not show improving survival in the smallest babies, the similarity of the survival rates at 22 and 23 weeks is compelling. Application of a retrospective calculation of sample size shows that the cohort was large enough to detect a difference of 13% in the survival rates of the infants born at 23 weeks in the two periods. We thank all the health professionals who were involved in the data collection. Contributors: JSD, ESD, BNM, and DJF developed the idea for the paper and drafted the paper. ESD and DJF designed the study. BM performed the statistical analysis, and JSD, ESD, BM, and DJF interpreted the results. All authors revised the paper critically and approved the final manuscript. DJF is the guarantor. Funding: NHS research and development funds from healthcare commissioners in the Trent region. Ethical approval: Local research ethics committee approval was obtained for each of the centres at the beginning of the Trent Neonatal Survey. In 2004 approval was obtained from the Trent multicentre research ethics committee. The neonatal survey obtained section 60 approval under the Health and Social Care Act for its programmes in 2002. The Patient Information Advisory Group also gave approval for collection of data without consent. House of Commons Science and Technology Committee. Scientific developments relating to the Abortion Act 1967. London: Stationery Office, 2007. Smith LK, Draper ES, Manktelow BN, Field DJ. Deprivation and infection among spontaneous very preterm births. Obstet Gynecol2007;110:325-9. Weindling AM. The confidential enquiry into maternal and child health (CEMACH). Arch Dis Child2003;88:1034-7. O’Dowd A. No evidence backs reduction in abortion time limit, minister says. BMJ2007;335:903. Wood NS, Marlow N, Costeloe K, Gibson AT, Wilkinson AR. Neurologic and developmental disability after extremely preterm birth. EPICure Study Group. N Engl J Med2000;343:378-84. Marlow N, Wolke D, Bracewell MA, Samara M, EPICure Study Group. Neurologic and developmental disability at six years of age after extremely preterm birth. N Engl J Med2005;352:9-19. Manktelow BN, Draper ES, Annamalai S, Field D. Factors affecting the incidence of chronic lung disease of prematurity in 1987, 1992, and 1997. Arch Dis Child Fetal Neonatal Ed2001;85:F33-5. Larroque B, Breart G, Kaminski M, Dehan M, Andre M, Burguet A, et al. Survival of very preterm infants: Epipage, a population based cohort study. Arch Dis Child Fetal Neonatal Ed2004;89:F139-44. Vanhaesebrouck P, Allegaert K, Bottu J, Debauche C, Devlieger H, Docx M, et al. The EPIBEL study: outcomes to discharge from hospital for extremely preterm infants in Belgium. Pediatrics2004;114:663-75. Markestad T, Kaaresen PI, Ronnestad A, Reigstad H, Lossius K, Medbo S, et al. Early death, morbidity, and need of treatment among extremely premature infants. Pediatrics2005;115:1289-98. Tommiska V, Heinonen K, Lehtonen L, Renlund M, Saarela T, Tammela O, et al. No improvement in outcome of nationwide extremely low birth weight infant populations between 1996-1997 and 1999-2000. Pediatrics2007;119:29-36. Tommiska V, Heinonen K, Ikonen S, Kero P, Pokela ML, Renlund M, et al. A national short-term follow-Up study of extremely low birth weight infants born in Finland in 1996-1997. Pediatrics2001;107:E2. Doyle LW, Victorian Infant Collaborative Study Group. Neonatal intensive care at borderline viability—is it worth it? Early Hum Dev2004;80:103-13. Riley K, Roth S, Sellwood M, Wyatt J. Survival and neurodevelopmental morbidity at 1 year of age following extremely preterm delivery over a 20-year period: a single centre cohort study. Acta Paediatr2008;97:159-65. Potential selection bias in hospital-based studies of perinatal outcome. Paediatr Perinat Epidemiol2004;18:153. Evans DJ, Levene MI. Evidence of selection bias in preterm survival studies: a systematic review. Arch Dis Child Fetal Neonatal Ed2001;84:F79-84. Hack M, Fanaroff AA. 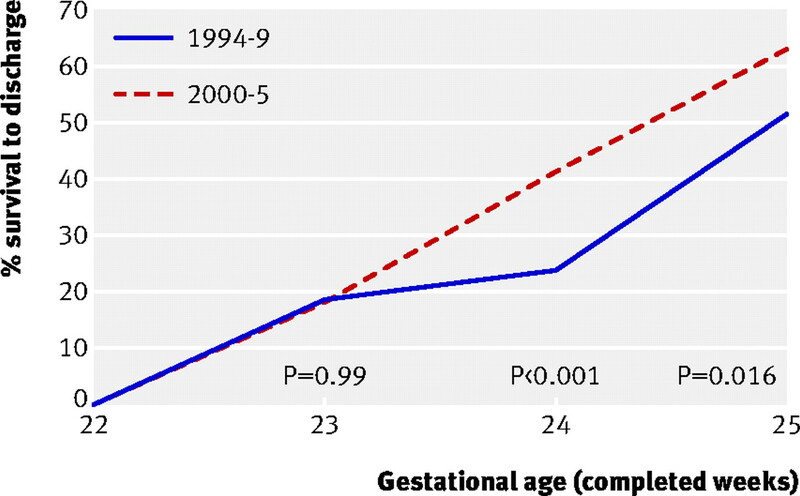 Outcomes of children of extremely low birthweight and gestational age in the 1990s. Semin Neonatol2000;5:89-106. Nuffield Council on Bioethics. Critical care decisions in fetal and neonatal medicine: ethical issues. 1st ed. London: Nuffield Council on Bioethics, 2006. American Academy of Pediatrics Committee on Fetus and Newborn, Bell EF. Noninitiation or withdrawal of intensive care for high-risk newborns. Pediatrics2007;119:401-3.